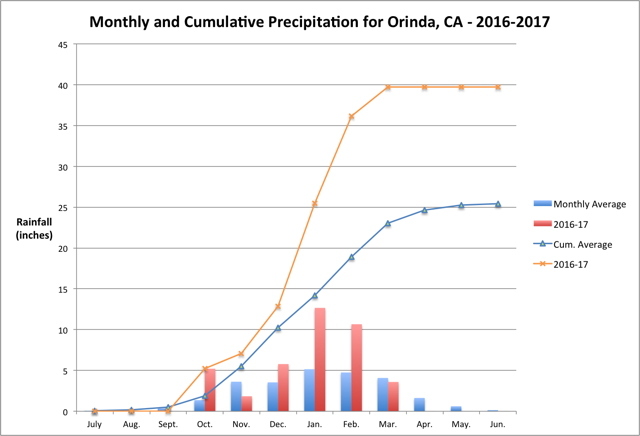 Monthly reports for the Northern California 2016-17 rainy season. Station Details: Davis Vantage Pro2, with Mac USB Data Logger. 2.4 GHz Intel Core 2 Duo MacBook, with 8 GB 1033 MHz DDR3 Memory, running Mac OSX Version 10.10.1 (Yosimite). 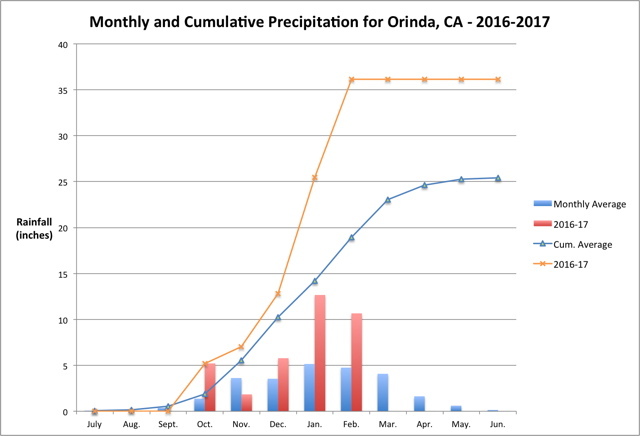 Re: Monthly reports for the Northern California 2016-17 rainy season. That is why he is known as Edouard the Magnificent. Usually by the crew at Orinda Motors as he pays for their holidays with all the jobs he gives them. . . . . Hey take it easy fellers!! I don't travel faster than a speeding bullet, leap the tallest buildings, etc., etc., etc., .. . . .
Nah, I spill that duty with a buddy of mine who also gives Orinda Motors plenty of business. In fact he should be paying the lion's share because he has: a 1956 Buick Super, a 1957 Chevrolet Bel Air, a 1965 Ford Mustang, and a 1971 Chevrolet Chevelle Malibu. Oh did I mention his daughter's 1970 El Camino? Dear WeatherCat West coast drought (? ?) watchers, . . . . Beyond Sunday models are having difficulty with the pattern and potential for rainfall. General trend over the past few runs has been wetter with the ridge struggling to rebound. This could lead to one or two additional chances of moisture. Needless to say, anyone with outdoor plans from Sunday into the middle of next week should stay tuned. So as da' man sez . . . . stay tuned!! I like your chart. We received 23 inches of snow yesterday (an all-time daily record) but I think that storm originated over Southern Cal before it came northeast to us. So I guess you can get them all but the water content of these winter storms has been great in the western half of the US. 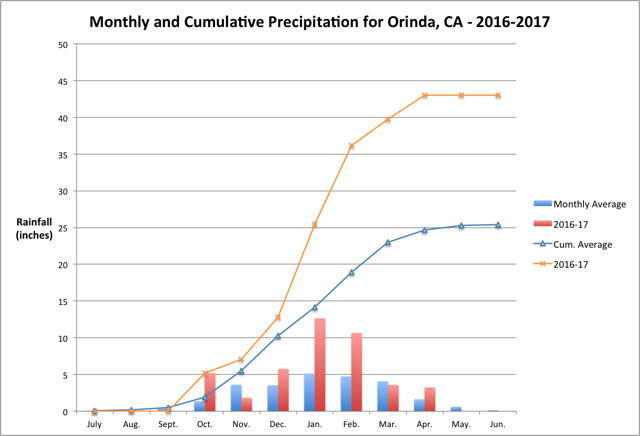 Even so we are at 173% of normal for the rainy season to the end of March. The forecast models aren't being so stable, but they were advertising another atmospheric river event starting about a week from now. The climate predication center also is consistent with such an event. So perhaps we shall continue to get beneficial rains. Alas, it looks like I'll have to start watering soon, the sun is now strong enough to start drying things out. We have received a foot of snow out of this week's storm that first dropped rain on you a few days ago. As a result, we are at 42.99" of rain when normal is just 25.4"!! That turns out to be 175% of normal. It is looking like May will at least start out warm and dry, but at this point the wet season is essentially over. The time has come to start using that water so the plants can survive the heat. Your April storms dropped a total of 29 inches of snow on us. This winter season, I measured almost 32 feet of snowfall at our place. This is a record and more than twice what we get in a normal winter! Our serious drought conditions were declared resolved a couple of months ago, at least for now. We haven't started to deal with runoff yet, but it is now warming up so we are being cautious. It has been quite a winter in the western United States.